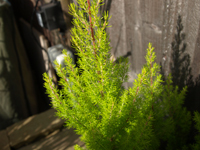 Throughout the garden there are a number of plants which had originally been bought simply because we liked the look of them and before we had started having specialised beds or themes! Nevertheless we still feel these plants add interest throughout the garden when something unusual pops up! In April 2009 we went halves with our nextdoor neighbours on putting up a new fence as their dog was able to jump over the original fence and neither of us had any privacy. Originally there were a lot of bushes along the fence line which we had to take out in order for the fence to put in. This gave us the opportunity to try and do something with the bed and in August 2009 we planted 5 Arum lilies, various varieties of Coleus and half a dozen conifers which we hoped would grow fairly quickly to hide the bareness of the fence. 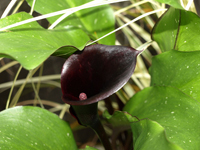 In 2010 a couple of the Arum lilies had started to peep through but when work started on completely revamping the garden they got moved and we're not sure exactly where to! 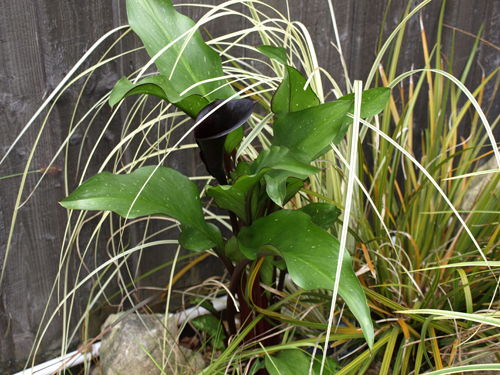 Suddenly in August 2012 we noticed that two of them had started to peep through in the middle of the grasses bed and one grew completely with a jet black spathe (Zantedeschia 'Schwarzwalder'). We have decided to leave it amongst the grasses as it's clearly very happy! 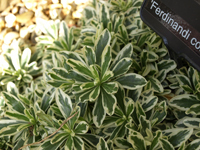 Ferdinandi-Coburgi – an attractive variety with cream-green variegated compact foliage and masses of single white flowers produced in sprays. 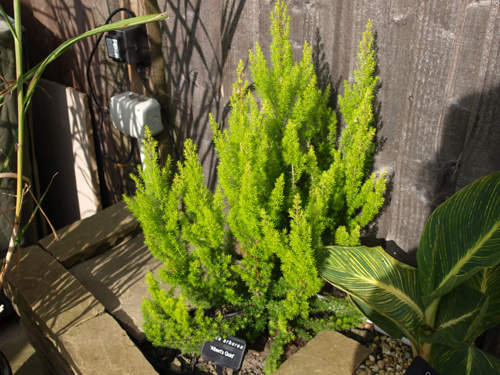 Two plants were purchased from All-in-One Garden Centre in Spring 2011 and they have settled extremely well and are beginning to spread. They are in the same small bed as the Canna and the Erica arborea. During the summer they were a mass of white flowers. You can see one of the Canna leaves in the top right-hand corner of the photo below. Both these Cannas were purchased from B&Q at £6.98 each. 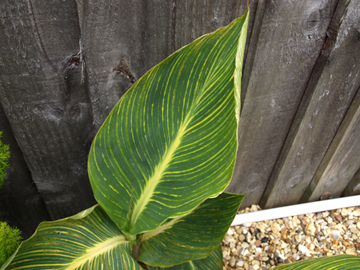 The left-hand one was labelled as 'Canna' and the right-hand one as 'Canal Gold'. Although Cannas should be lifted and stored in the greenhouse (under the staging) or in a garage over the winter, I have to confess that ours haven't been lifted and they have survived the last two winters! 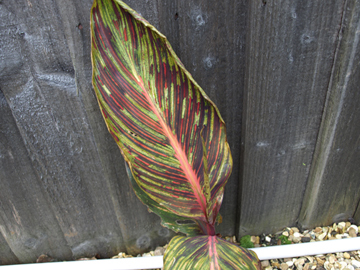 It's interesting to note that the labels, which were in the pots when we bought them, don't make any mention of lifting the cannas and storing them over the winter! Photos taken 3rd September, 2012. 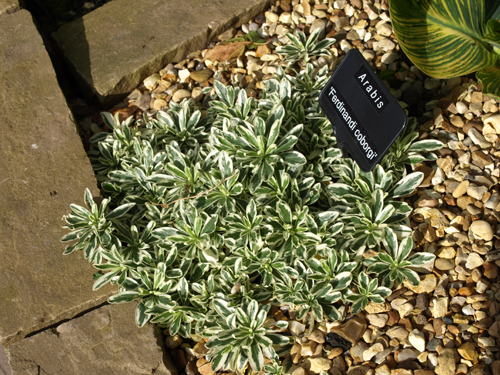 'Alberts Gold' was a plant that Mike particularly liked as his grandfather was named 'Albert'.